We have in this Town two Parishes, both of which have agreed to erect Workhouses. One is finished, and settled under good Regulations, the other is in some Forwardness, and we hope soon to see it perfected, from whence I promise my self some good Fruits, that I cannot see from our Charity School, which, considering the Nature of our Poor, and some other Circumstances, can hardly ever be brought to answer the first Intentions of the Subscribers. It is therefore wished that the Charity which supports the School, were grafted on the Workhouse and thereby both may become more useful. A parliamentary report of 1777 recorded parish workhouses in operation in Marlborough—St Mary for up to 52 inmates and in Marlborough—St Peter and St Paul for 50 inmates. Wiltshire: Avebury, Berwick Basset, Broad Hinton, East Kennet, Fifield, Mildenhall, Marlborough St Mary (2), Marlborough St Peter and St Paul (2), Ogbourne St Andrew, Ogbourne St George, Preshute, West Overton, Winterbourne Basset, Winterbourrne Monkton. The population falling within the union at the 1831 census had been 8,774 with parishes ranging in size from East Kennet (population 103) to Marlborough St Mary (1,849). The average annual poor-rate expenditure for the period 1833-35 had been £5,250 or 12s.0d. per head of the population. 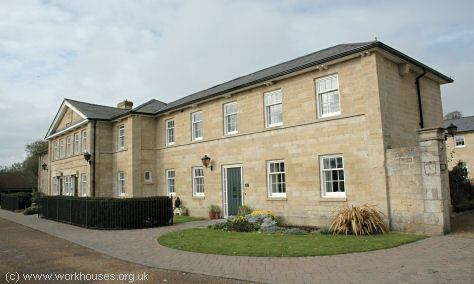 Situated to the north of the town, the new workhouse for 180 inmates was built in 1837. It was based on a standard cruciform plan to a design by W Cooper, for which the Poor Law Commisioners authorised the expenditure of £4,362. The builder was T Willes. 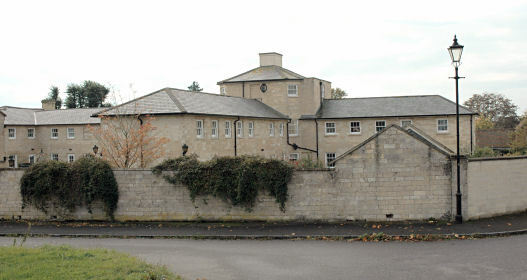 Marlborough workhouse from the east, 2000. The workhouse entrance block contained the Guardian's board room, porter's room, waiting room etc. Marlborough entrance block from south, 2000. 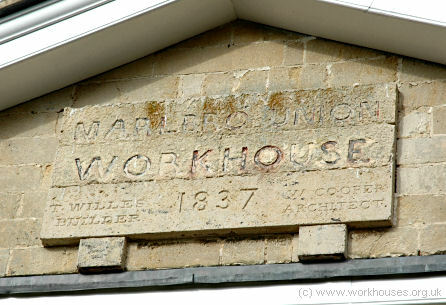 The pediment over the entrance block contains a slab recording the date and architect of the workhouse. The upper portion suffered when it was concreted over in contravention of the building's current listed status. To the rear, accommodation wings for the various classes of inmate (male/female, infirm/able-bodied etc.) radiated from a central supervisory hub where the workhouse master's quarters were located. Marlborough from the north-east, 2000. A two-storey block at the north-east side of the site may have been a vagrants' ward. The workhouse later became Marlborough Poor Law Institution then a Children's Convalescent Hospital. It has now been redeveloped as retirement housing. Wiltshire and Swindon Archives, Wiltshire and Swindon History Centre, Cocklebury Road, Chippenham SN15 3QN. Limited holdings include: Guardians' minutes (1845-1917, with gaps); Annual returns of lunatics (1885-1893); Relied order book (1910-17); etc.